Dr. Richard Restak is Clinical Professor of Neurology at The George Washington University School of Medicine and Health Sciences. He earned his M.D. from Georgetown University School of Medicine and completed his postgraduate training and residency at St. Vincent's Hospital, Georgetown University Hospital, and The George Washington University Hospital. Professor Restak also maintains an active private practice in neurology and neuropsychiatry in Washington, DC. 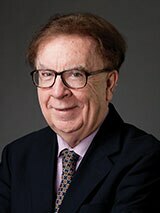 Professor Restak's awards include the Chicago Neurosurgical Center's Decade of the Brain Award and Georgetown University Medical School's Linacre Medal for Humanity and Medicine. A former president of the American Neuropsychiatric Association, Professor Restak is the prolific author of 20 books on the human brain-4 of which were chosen as Main Selections of the Book of the Month Club-as well as numerous articles in national newspapers, including The New York Times and USA Today. Professor Restak has delivered lectures on neurology to prestigious institutions and associations around the world, including NASA, the National Security Agency, the CIA, the Smithsonian Institution, and the Brookings Institute.